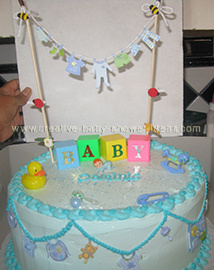 Free Baby Shower Cake Picture Gallery! 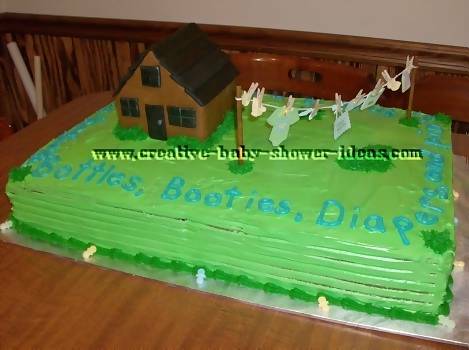 Don't you love cute baby shower pictures? This section is full of clothesline themed baby cakes that our readers have made and submitted to us. There are also lots of other cake ideas in the gallery that you can view by clicking on the edible cake index below. "Wow! Your site is amazing! I love all the information and work you put into it! Thank You!" You can also share your cake photos and tips with us here. The first tier is a mocha cake with baileys chocolate truffles filling. The second tier is butter pecan with Swiss meringue buttercream frosting. I made the buttons and quilting details with fondant. I found the cutest baby clothes and toys at a scrap booking store, so I made a clothes hanger out of wire and kabobs to hang them. This is a carrot cake with cream cheese icing. I made it using a 16 1/2 x 12 3/8 oval cake pan. All the decorations are made from fondant. 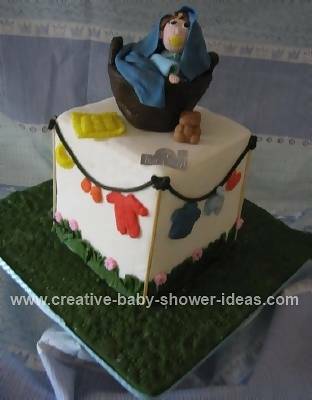 Julie sent in an adorable baby clothesline cake to share with us. The two tiers were made with 2 layers of an 8 inch cake and 2 layers of a 5 inch cake. Everything was iced with vanilla buttercream. All of the little clothes were cut out of fondant using the Wilton Fondant People cutter set. 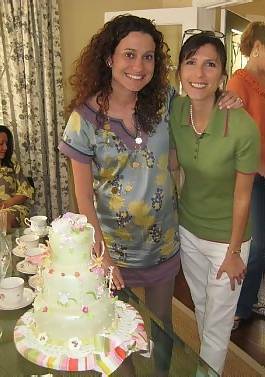 The details on the clothes were made with matching buttercream. 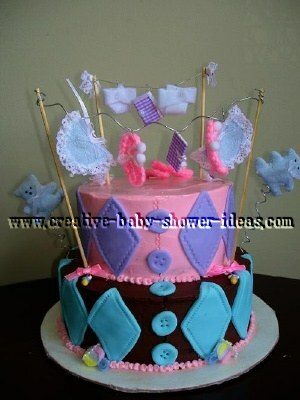 The clothesline and clothespins were made from fondant. 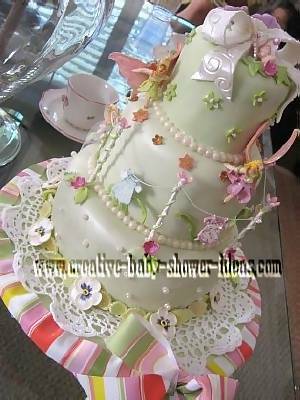 She finished it off with pastel multi-colored shells to match the theme of the cake. Really cute Julie. Thanks for sharing! 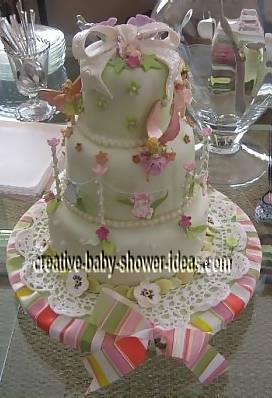 baby shower cake 10 in. round 2 layers Detailed Instructions and how-to-tips: I baked two 10 in. 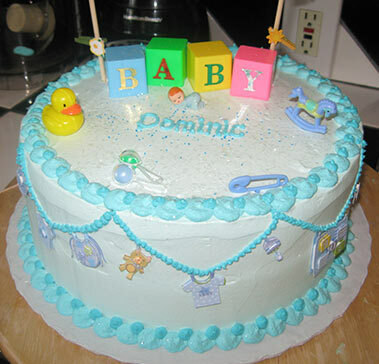 round chocolate cake layers, filled them with ganache, and covered the entire cake in whipped cream tinted baby blue. 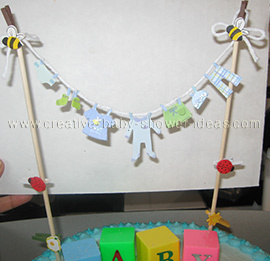 I used bamboo sticks and string to create the clothesline and used 'baby clothes' stickers to hang on the clothesline. I made this cake for my Sister in law last week. It was so much fun, and my sister Susan helped to assemble it on site. After baking all 3 cakes, layer each with a cream cheese frosting. Top each center of each cake with sweetened coconut (not the sides). 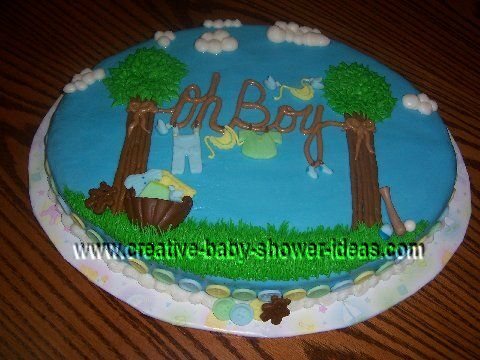 Cover all layers with fondant that has been tinted with moss greed edible color. All fondant decorations were handmade and painted with luster dusts, and lollipop sticks were used for the clothesline poles. All baby dresses were cut from molds, and hand painted. 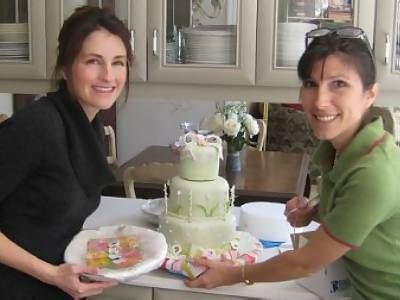 99% of fondant decorations were made weeks in advance and stored in airtight containers. 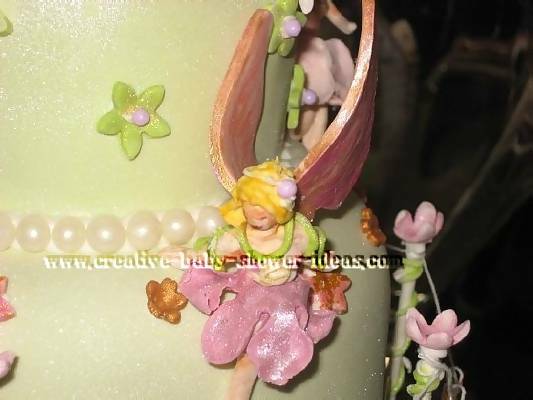 Butterfly cookie cutters were used for the fairy wings, which were fastened with royal icing. The wings were hand painted. This cake was for my best friend's baby shower. It was so much fun to make, and not as difficult as one would think. I used dowels throughout the tiers, but allowed the weight of the cake itself to push them down. (How easy!) 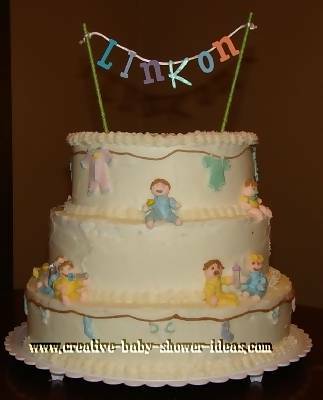 I used buttercream frosting for everything except the baby clothes. For that I used royal icing and applied them when dried. I also used tiny baby bottles from the Dollar Tree! The topper is made of candy sticks wrapped in ribbon, and then wooden letters hot-glued to a satin cord. I hope this photo might inspire someone else looking for ideas. I just made a sheet cake. Cut a Styrofoam block in a house shape, well my husband did that, covered it with fondant. I used dowel rods for the clothesline poles and scrapbook stickers for the clothes.